Seeing Doug and Carol Sundman first thing every Monday morning has become a bright spot in Giving Children Hope staff’s days. 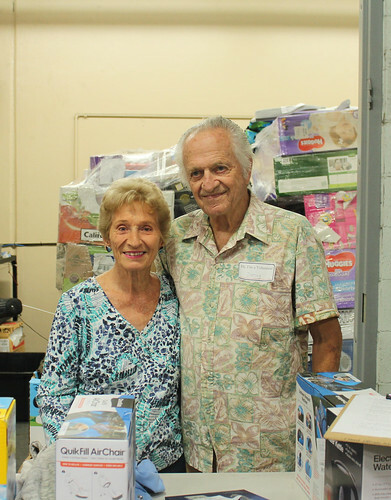 This sweet couple was finding it difficult to find an organization that would take volunteers over the age of 75 when they decided to start volunteering with GCHope. The both of them had heard of our organization before (Doug through Operation 29:11 and Carol through the school district she had worked for), but the more they learned about what we do, the more they were thrilled to be helping here. For the past 7 months, Doug and Carol have volunteered in both the We’ve Got Your Back and Crisis and Disaster Relief programs, helping with everything from packing rice and beans, to filling backpacks, to sorting through donated supplies for our relief efforts. They get excited thinking about the recipients of all the work that takes place in the warehouse; they feel that if they can be a small cog in the process of helping those we serve, then that is exciting to them as they know they are a part of doing good in this world. Over the past several years, Doug and Carol have had to make adjustments to how they go about life, and have switched from talking RV camping trips and games of mini golf and bowling, to activities closer to home such as yard work and spending time with close friends and family. While there have been changes for them, they know that God is in control and He will make things good no matter what.